Offering you a complete choice of products which include sheet metal electronics parts. We are manufacturer, supplier and exporter of Sheet Metal Electronics Parts. This helps their customer to focus on their core strength/business to increase productivity and profitability. These are highly appreciated by our clients for its wide use. 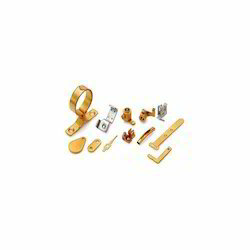 These parts are used in varied industries like automotive, electronic and defense. Our offered range of Sheet Metal Electronics Parts can be availed at market leading prices. Looking for Consumer Electronics Parts ?